Four hundred years ago the valleys and tributaries of the Ouachita, Red, Sabine, and Neches rivers in what is today northeast Texas, northwest Louisiana, southwest Arkansas, and southeast Oklahoma were home to an extraordinary society of farmers, warriors, potters, priests, and traders, the ancestors of the people known today as the Caddo. They were a powerful and populous people linked by language, kinship, and beliefs, but divided into several dozen named groups, each having its own history, territory, and traditions. Collectively, the Caddo-speaking peoples formed a society that early Spanish explorers highly regarded as civilized and friendly in comparison to many of their neighbors. Sadly, this initial respect did not spare the Caddo from the common fate of so many of the native societies who came into contact with European diseases, guns, and desires. In less than two centuries, the mighty Caddo were reduced to a few hundred refugees who were assigned tiny parcels of land in the Oklahoma Indian Territories, almost 200 miles west of their homeland. Against all odds, the Caddo survived their nineteenth-century low point and today number over 4000. The members of the Caddo Nation of Oklahoma don't live on a reservation and many of them don't even live in Oklahoma; they live in houses and apartments in America's cities and rural areas. They are police officers, nurses, lawyers, electricians, artists and more, ordinary Americans with a fascinating heritage stretching back untold thousands of years and far beyond living memory into the ancestral realm of song, ash, and relic. Like many Americans, Caddo peoples strive to maintain and rekindle their cultural traditions amid the harried pace and dizzying changes of modern life. And they wish that more people understood their tribe's proud history and many accomplishments. Tejas is the Spanish spelling of a Caddo word taysha, which means "friend" or "ally". In the 17th century the Spanish knew the westernmost Caddo peoples as "the great kingdom of Tejas" and the name lived on to become the name of the 28th state of the United StatesTexas. These interwoven exhibits on the theme Tejas: the Life and Times of the Caddo Indians provide an intimate look at the Caddo's long and distinguished history, at ancient and living Caddo tradition, and at the tribe's many contributions to the cultural heritage of Texas, Louisiana, Arkansas, and Oklahoma. The Tejas exhibits explain who the Caddo are, who they were, where they came from, and what Caddo life was like in different points in time. Archival and modern photographs, artwork, documents, maps, and sound clips augment the written discussions. We recommend that you start with the Caddo Fundamentals exhibit and then jump to any of the other Tejas exhibits to learn more and see hundreds of images that help tell the history of the Caddo peoples. You can follow Caddo history from earliest times to today by starting with the Caddo Ancestors exhibit and clicking on icon at the end of each exhibit section and then continue on to the Caddo Voices exhibit and do the same. Caddo Fundamentals: Introduces the Caddo and their world: who they are, who they were, their homeland, and how we learn about the Caddo past. Caddo Map Tool: Explore the Caddo Homeland with this interactive map. Caddo Ancestors: Summarizes what archeologists have learned about the prehistory and early history of the Caddo and their probable ancestors in and near the Caddo Homeland. 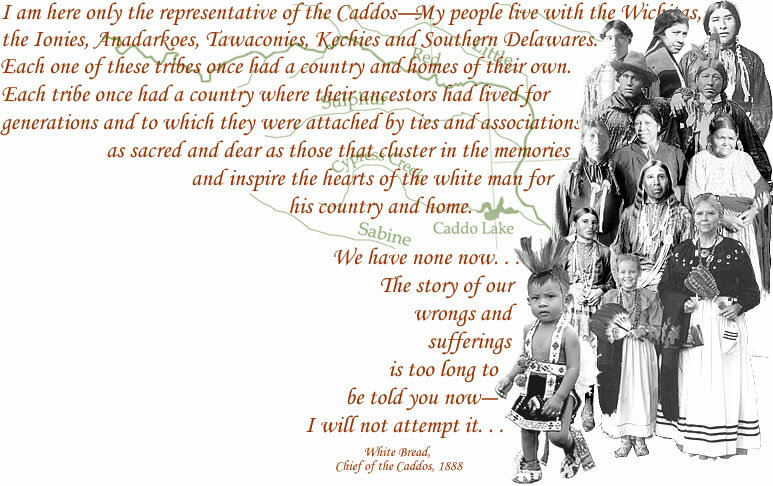 Caddo Voices: The history of Caddo people over last two hundred years told by Caddo elders and other Caddo voices past and present. Created in Clay: The extraordinary Caddo pottery tradition is showcased in this exhibit. The accompanying galleries feature photographs of ancient and modern Caddo pots that can be rotated 360°. World of the Caddo: Kids young and old will enjoy learning more about the Caddo Indians in this special exhibit. Teaching about the Caddo: Special exhibit section for K-12 teachers. Nasoni: exhibit on the Hatchel-Mitchell archeological site, believed to the remains of Upper Nasoni village visited and drawn by Terán de Ríos in 1691-1692. Sha'chahdínnih: exhibit on the Timber Hill archeological site, believed to be the remains of the last Caddo Indian village in the original Caddo Homeland, occupied from 1800 to 1840. Lake Naconiche: exhibit focuses on a series of hamlets and small villages occupied by a little-known prehistoric culture called the Naconiche Caddo. Pine Tree Mound: exhibit on the site of a significant Nadaco Caddo community and ceremonial center, composed of more than a dozen household compounds and a ceremonial precinct with three temple mounds. Many organizations and individuals have made Tejas: Life and Times of the Caddo possible. The project was launched with grants from the Texas Council for the Humanities and the Houston Endowment. The Temple-Inland Foundation provided additional major funding that sustained the project and enlarged its educational components. Two statewide organizations, the Texas Archeological Society and the Council for Texas Archeologists, and individual members of those organizations have helped support the project as have other partner organizations including the Texas Parks and Wildlife Department and the Texas Historical Commission. The Caddo Nation of Oklahoma deserves special recognition. Its members are the living descendants of generation upon generation of Caddo peoples. The Tejas exhibits were developed in consultation with the Caddo Nation. Tribal members provided photographs, memories, sound clips, and artwork, and encouraged the project in many other ways. The Tejas exhibits were written mainly by Dr. Steve Black, editor of Texas Beyond History, Dr. Timothy K. Perttula, Consulting Archeologist for the Caddo Tribe, and Cecile Elkins Carter, historian and Caddo tribal member. Dr. Dee Ann Story helped with the writing of the Caddo Ancestors exhibit and provided much-needed advice throughout the exhibit preparation process. Susan Dial, Co-Editor of Texas Beyond History, wrote the "World of the Caddo" exhibit. Advisors and Reviewers: Cecile Carter, Robert Cast, Darrell Creel, Ann Early, Jeff Girard, Bobby Gonzalez, Lee Johnson, Jami Lockhart, Tim Perttula, Robert Rogers, George Sabo III, Frank Schambach, Dee Ann Story, and Don Wyckoff. Web Design: TBH Webmaster, Meg Kemp, designed the Tejas exhibits (except the map tool) and put them together. Map Tool: Justin Hays, TBH Intern, Summer 2003, designed and created the Caddo Map Tool. The shaded relief base map is from NationalAtlas.gov. The potential vegetation map data is from A.W. Kuchler of the USGS. Jami Lockhart provided helpful advise. Ann Early, Jeff Girard, Tim Perttula, George Sabo III, Frank Schambach, Dee Ann Story, and Don Wyckoff provided photos, captions, and descriptions. Photographs: Robert Bell, Steve Black, Ken Brown, Cecile Carter, Susan Dial, Jeff Girard, Dayna Bowker Lee, LaRue Parker, Bill Martin, Sharon Mitchell, Marilyn Murrow, Tim Perttula, George Sabo III, Frank Schambach, Donna Smith Spaulding, Dee Ann Story, Mark Walters, and Don Wyckoff. TBH Spring 2003 Intern Erin Baudo scanned and/or worked with most of the photographs. Graphics: Justin Hayes created most of the unattributed maps based on the shaded relief map from NationalAtlas.gov and the classic physiographic map of the United States drawn by Erwin Raisz© 1957 used by permission of Raisz Landform Maps, Brookline MA, 1-800-277-0047. Other graphics created by Dee Ann Story, Robert Rogers, Tim Perttula, F. Todd Smith, Nancy Reese, Jami Lockhart, Clayton Drescher, and Ken Brown. Artists: Paintings and drawings by T.C. Cannon, George Catlin, Nola Davis, Julien Fevret de Saint-Memin, Louis Gregoire, George S. Nelson, Edwin Martin, Martin Pate, Reeda Peel, Frederick Remmington, Terry Russell, L. K. Townsend, and Thompson Williams. Pottery by Jereldine Redcorn and Chuck Hixson. Organizations providing photographs and artwork: Arkansas Archeological Survey, Cahokia Mounds State Historic Site, David Rumsey Map Collection, Institute of Texan Cultures (UT San Antonio), Louisiana State University Digital Library, National Anthropological Archives (Smithsonian Institution), Oklahoma Archeological Survey, Oklahoma Historical Society, Omaha Public Library, PBS&J, Pictures of Record Inc., Sam Noble Oklahoma Museum of Natural History, Southeast Archeological Center (National Park Service), Texas Archeological Research Laboratory, Texas Archeological Society, Texas Historical Commission, Texas Parks and Wildlife Department, Watson Library (Northwestern State University), Western History Center (University of Oklahoma), William Mathers Museum (Indiana University). These and other organizations and individuals who have contributed to the Tejas exhibits by providing photographs, artwork, writing, information, text, and guidance are identified where appropriate throughout the exhibits and further acknowledged in the "Credits and Sources" sections that accompany each of the Tejas exhibits.